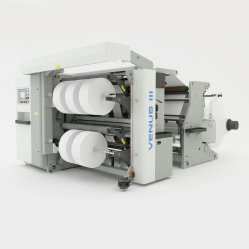 The new generation VENUS III slitter rewinder is a top of the range, high performance, servo-driven machine that offers mid and wide web printers and converters maximum efficiency in slitting a wide range of substrates at high speed. 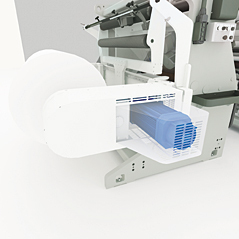 The overhead web path between unwind and rewind unit is an innovative design feature that promotes a clean working environment. 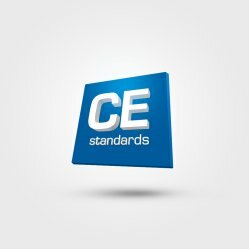 This feature permits entry into new market sectors such as the pharmaceutical and food packaging industries where stringent hygiene and clean room standards are in force. Features include automatic knife positioning, automatic laser core positioning, intuitive touch screen controls, improved splicing table, integrated unloading system, driven tilting stand, slit edge removal system, problematic edge cutting and minimum gap winding. A new innovative generation of VENUS III slitter rewinders is characterised by an excellent price to quality ratio and offering unbeatable parameters in a top range of models with high added value. 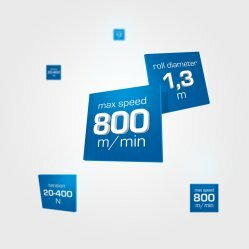 Rigid construction guarantees maximum mechanical speed of 800 m/min, max. rewind diameter 815 mm, max. unwind diameter 1,500 mm with max. roll weight 2,000 kg and min. slit width 25 mm. 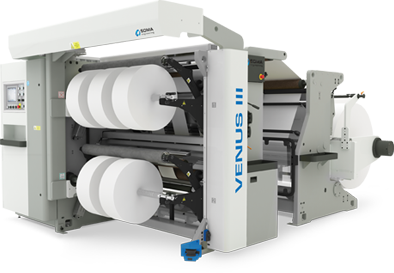 The VENUS III slitter is available in 1,350 / 1,600 / 1,850 mm width versions. Rigid construction, precise tension control system with closed loop, AC servo motors and a gamut of unwind and rewind tensions guarantee excellent processing on a wide range of materials including PP and PET from 8 microns, HDPE from 12 microns, LDPE from 20 microns and paper from 17 gsm. A variable knife shaft section permits tangential slitting with lower and upper rotary knives or with razor blades against grooved segment. 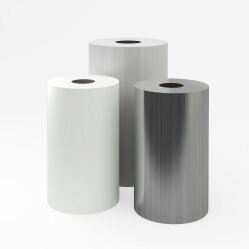 For more difficult thin substrates it is possible to choose wrap around female knife slitting with rotary knives. An optimised solution with three AC servo motors and low energy consumption.The system includes main motor drives, drive and lay-on rollers, knife shafts and banana roller. An unwind AC servo motor in combination with a dance roller control tension and react to deviations in the material by braking or driving the parent roll. The third AC servomotor drives both rewind shafts. Shaft-less unwind with pneumatic chucks in combination with integrated roll loading through hydraulic tilting arms ensure easy roll handling and offer high efficiency and operator comfort during job exchange. A vacuum splicing table with two pneumatic holders and back-lit desk enables easy and precise web splicing and makes for higher efficiency during job exchange. Automatic knife / blade positioning system ensures quick, precise and easy setting and reduces time during job changeovers (20 pairs of knives in less than 120 sec). This system is ideally combined with automatic laser core guiding. Automatic laser core guiding enables precise and very quick core setting for new jobs. The system uses common data with the automatic knife positioning system and provides an efficient solution for quick job exchange. 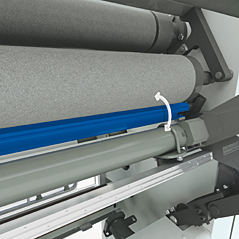 An unloading mechanism assists with heavy slit roll handling and increases efficency during the working cycle. An unloading arm delivers the finished slit rolls to a rotary stand. The hydraulic tilting rods are able to rotate in a horizontal or vertical direction. All machines are equipped with recipe system for storing of all working parameters as standard. Speed, tension, lay-on pressure, knife / blade setting and laser core guiding position information is stored in a touch screen display memory. 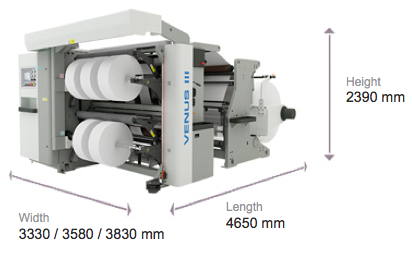 Automatic cross slitting ensures quality and safety with greater operator comfort and conversion of a larger number of finished reels. 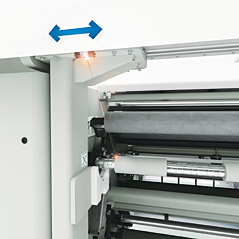 Combined with laser guiding and strip holders the system holds the web in place and permits a faster and more efficient work cycle and high quality slit rolls. 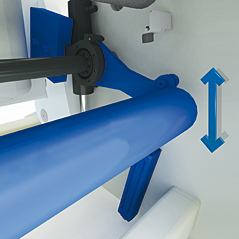 The Tenzomat II tension control system enables precise unwind and rewind tension control during the whole operating cycle in a closed loop. Deviation in unwind web tension from the required value is detected by a change of dance roller position. A control unit increases or decreases the braking effect of the AC servomotor prior to any effect on slitting quality. An advanced PID control system manages the slitting process of very thin and difficult substrates. Precise rewind tension control through PLC and tenso-meters measures real tension value at every moment of the operating cycle. These values are compared through software with pre-set tension value (calculated by internal algorithm) and any detected tension deviations are corrected by air pressure change under friction tapes in the rewind shafts. The friction force is converted by friction rings to tension in slit web strips. The friction rings guarantee precise distribution of the total tension to the web strips. The tension is calculated in kg per 1 meter of web width and converted via software according to taper curve with respect to the actual rewind diameter. An adjustable angle, driven banana roller with hard grooved segments is positioned before the lower knife shaft and significantly increases slit quality on poor substrates. 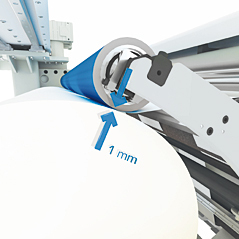 An adjustable angle eccentric roller ensures web laying on the lower knife shaft during slitting of wrinkled material and improves slit quality. 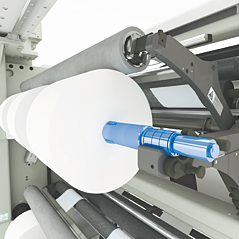 An adjustable guiding roller laterally balances the web and contributes to higher quality output during slitting from conical or low quality parent rolls. Lay-on rubber rollers on tilting arms are fixed on a rod with spring-loaded segments ensuring perfect contact between lay-on roller and finished reel. 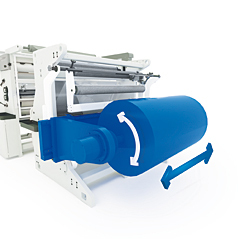 For each rewinding shaft it is possible to set and automatically control tension according to finished reel width and diameter ensuring high quality rewinding. 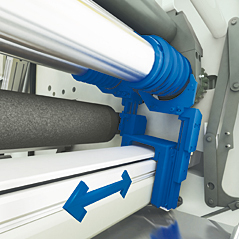 Strip holders hold the web in place and maintain the tension in slit strips during machine stop. 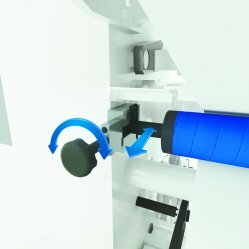 Holders are automatically activated and deactivated with machine start-up for greater operator comfort, maximum time of use and higher quality slit rolls. This rewinding technique is used to eliminate pressure of the lay-on rollers to the slit rolls. 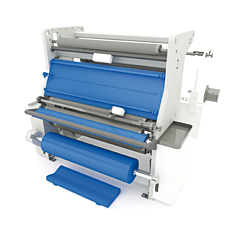 The rewound slit strips are precisely guided to ensure high quality roll edges. This type of rewinding is usually used for processing materials such as pressure sensitive, self adhesive, cold seal and special structures. 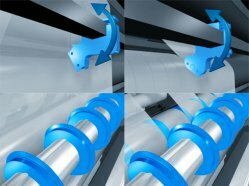 Torque rewinding with pneumatic expanding shafts is an alternative solution to friction ring rewinding. It is mainly used for very narrow slit rolls of high quality materials where friction ring technology is not feasible. 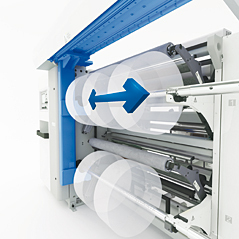 The E&Q concept efficiently handles waste management through linking the slitting and rewinding system with 100% print face inspection. 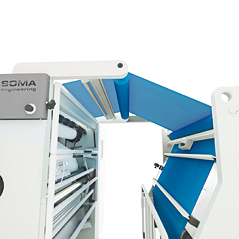 Slitter management including start-up, deceleration and machine stop is synchronized with the print face inspection system which compares and evaluates all operating parameters and identifies any print errors on the web. The slitter and rewind system automatically stop at the beginning of any detected error allowing the operator to cross cut and remove the defective material and splice the web on an auxiliary splicing table. Slitting and rewinding is then automatically resumed. The overhead web path design on the Venus lll is an innovative feature that permits entry into new market sectors such as pharmaceutical and food packaging where stringent hygiene and clean room standards are in force. The overhead design means that the material web is guided at a sufficient height above floor level to secure clean processing and easy slitter and production area maintenance. 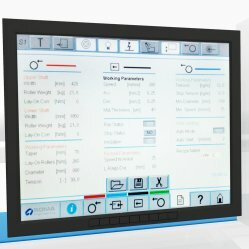 Touch screen control panels with user friendly interface in the rewind and slitting sections indicate error displays and settings of job parameters. An auxiliary control panel in unwind section with portable control panel for parent roll loading ensures quick and comfortable handling of the input roll. Aesthetic and ergonomic design with high quality surfacing of all machine parts. 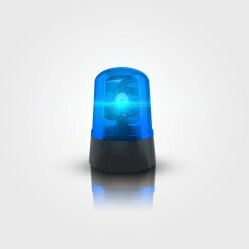 Machines are designed with maximum emphasis on operator safety. All rotating elements in the slitting section are secured by safety covers and are inaccessible to the operator during the operating cycle. The rewind area is secured by a laser scanner.